There are many cities that you can visit in the United Kingdom. Travelling to a foreign nation is not an easy undertaking and in the correct of ways – you have to research widely about the place you intend to visit. And if you live in the UK and planning to visit one of the neighbouring cities, you have to know all that goes on in the city of your dreams. Essex is one of the amazing counties that surround London in England. It also covers the eastern region of the ancient Kingdom of Essex and thus it is a great tourist attraction. The county stands out above other counties in the country when it comes to entertainment. You can enjoy its diverse set of theatre offerings, alongside incomparable means of transport to the theatre halls and performances as well as best accommodation. In essence, there is a lot in the region you should be prepared to enjoy. If you are looking to book theatre coach trips UK, then you have plenty in the offering. You have plenty of options at your disposal, and you have to figure out what you really need for your theatre trips to be a success. With a large number of vacationers looking for the best theatre coach trip options, the number of theatre shows and providers has also increased. However, it can be daunting to choose the best theatres in Essex. You should not be spoilt for choice if you know where to start. How can you visit the counties of Essex and fail to have some fun at the Cliffs Pavilion, Westcliff-on-Sea? It is the top-notch theatre in the Southend-on-Sea region and comes with amazing facilities. For instance, it comes with its own self-contained car park and you will leave your car in safe hands as you enjoy your Essex coach trips. You don’t have to worry about seating space at the Cliff Pavilion, as it has enough space for everyone. The theatre can accommodate hundreds of film enthusiasts and you can visit the theatre from Monday to Sunday depending on your preferences. The Palace Theatre is one of the widely recognized cinemas and music halls in Westcliff-on-Sea Essex. It is easy to access the cinema hall and enjoy your favourite films, as it is just one mile from central Southend. The theatre is also known for its amazing ambience and tradition that calls into question its distinctive exterior. Don’t hesitate to visit The Palace Theatre and enjoy fantastic drama, local productions, and comedy as well as group performances. If you are looking for one of the best theatres in Essex, feel free to try out Kenneth More Theatre. The theatre hall is located in Ilford Town centre and it is opposite the Town Hall in Oakfield Road. The auditorium is well air-conditioned and huge enough to accommodate movie enthusiasts from all walks of life. Whether you want to catch up the latest romance films or action movies, you can have the best times of your life at the Kenneth More Theatre. Book your ticket today and have fun. Located in Colchester, Essex, Headgate Theatre is one of the frequently visited Essex theatre and will without a doubt satisfy your needs. It is exceptional as well as a small multipurpose theatre that you will definitely fall in love with. It features an auditorium that comes with removable seats and a studio that you can hire. It’s licensed bar is also a great attraction among many revellers and movie fans. You can imagine watching your favourite Friday night action film while sipping your favourite alcoholic beverage. It’s an amazing feeling. If you have been to Essex, you have probably visited the famous Stage One Theatre Company. The cinema palace is based in The Annexe, Century House and is within the Albert Road. With these directions in your fingertips, you should not miss your favourite film from Monday to Sunday. Stage One Theatre Company has been in operation for a number of years and it will definitely satisfy your needs. You will enjoy entertainment from the best musical theatre groups and get a chance to be entertained by the best actors in the UK. Stage One Theatre Company has set the highest artistic standards that many competitors have been trying to match over the years. When you talk of the best art scene in Essex, Mercury Theatre will definitely come into the picture. It is one of the reputed and active theatre venues in the county. It is located next to Balkerne Gate and on the western part of the town centre. It also overlooks the Roman Wall. Hence, besides the many artistic works exhibited in the theatre, its location itself is a major attraction site. Mercury Theatre opens all the time and it is the home of widely regarded original work from many respected artists. It has two auditoriums that can accommodate thousands of movie adherents. The theatre also has The Digby Gallery widely acknowledged for showcasing local art and promoting local artists. Braintree theatre has grown over the years to become the heart of entertainment in Essex. It is based in the famous grounds of Notley High School as well as Braintree Sixth Form. It comes with amazing and one-of-a-kind auditorium that can hold more than 300 people on their seats and more than 400 people standing. You can watch any show you want at the main auditorium. It offers varied genres from live music to Shakespeare films. In essence, any kind of entertainment you yearn for is at your disposal. The theatre is also known for providing new, fresh and emerging talents in Braintree and surrounding areas an opportunity to showcase their creativeness and desire to succeed in the theatre and arts entertainment industry. Located within the Butler Road Halstead, Essex, The Empire Theatre is a great place for movie and cinema enthusiasts. The theatre offers its clients with a small entry fee that includes prize raffle. You can also enjoy the best refreshments and cinema treats. You can book tickets at the theatre and there are also vouchers that you can use against the tickets. It is easy to contact The Empire Theatre management via email or its website. Located at the 233 Springfield Road Chelmsford, Essex, The Old Court Theatre is one of the best entertainment places you can visit on your coach trips in Essex. The theatre has been operating for many decades without any shortcomings. It is known over the years for the best productions, poetry, musical and comedy for its members. The Old Court Theatre also features an amazing auditorium that can take up to more than 100 people and the Monday to Sunday shows are usually sold out. The theatre is also known for offering disabled facilities that come with coffee and bar shops. Its large membership has also been a major attraction among many residents of counties of Essex. The Thameside Theatre is a great attraction for theatre enthusiasts from all walks of life. Whether you are visiting Essex for the first time or a frequent visitor in the Grays, Essex located theatre, you will without a doubt enjoy the best art scenes. It is a multi-purpose theatre that includes the Grays library, an exhibition area and Thurrock Museum. The theatre also has a comfortable bar that you can always visit before and after performance without any reservations. Feel free to stay stacked on the best drinks and delicacies as you enjoy every performance. You should not have any worries visiting any of the incredible Southend theatre. Most of the theatres in Essex have active websites where you can visit and learn more about the available form of entertainment. You can visit the website of the theatre of choice and book your show ticket and learn more about your coach trip. It is easy to book a ticket online. You can book one in advance while travelling to Essex or at the comfort of your home. With many hit shows gracing the entertainment sector on a daily basis, you should not be left behind. 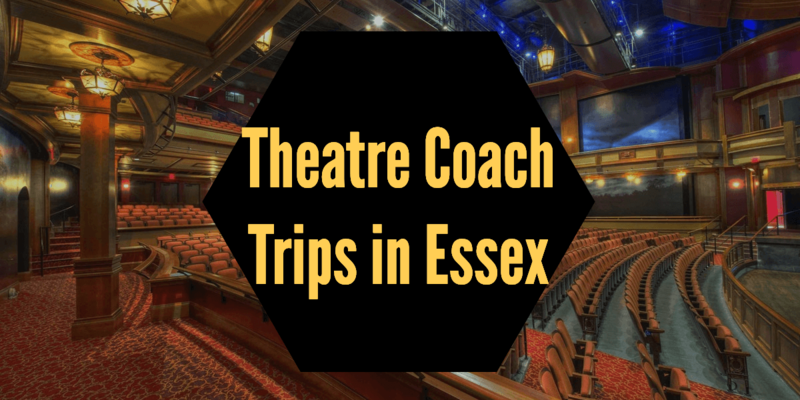 You can make theatre coach trips to Essex and enjoy every moment. You will not only save extra money but also get a chance to enjoy the UK beauty and visit many theatres in the region. Most of the reputed theatres have parking spaces, reliable accommodation services and you will undoubtedly fall in love with the kind of entertainment at your disposal. The easiest ways to buy theatre tickets is online, but you can also call the box office and find out about the options you have at your disposal. If you are planning a journey and would like us to provide a FREE no obligation quotation then simply fill in your details using the form below.